Two of the most useful mods to my Grand Cherokee (besides armor, lift & lockers) have been the slide out rear table and hatch door mounted camp light. They've come in handy soooo many times, from day trips to full camp outs. I haven't gotten around to building/buying a tailgate table yet for the new Wrangler, but I realized right away that a camp light would be an excellent inexpensive first mod... It just took a while for the parts to get here! The rear glass on a JK's hard top is just the right size for a 1 meter strip light, and the cargo 12v accessory outlet nearby makes getting power for it simple! You can get 12v flexible LED strip lights with an adhesive back all over eBay, Amazon, and even the local Autozone (though you'll likely overpay locally). The main option to look for is the chip density - i.e. how many LEDs are you getting? Different places specify this in different units such as total LEDs on the strip, LEDs/foot, or LEDs/meter - so be sure you are comparing apples to apples. Almost all of them are 12v, but if you limit your search to automotive categories then you know for sure you're getting as trip rated for the correct voltage. I considered running both white and red lights again - red isn't as harsh on the eyes at night and lets them stay adjusted for night vision. I was also unsure just how bright might be too bright for the main white strip... then it occurred to me, why not just get the single brightest strip I could find in white and use a dimmer switch? Then I could have whatever intensity the situation/mood called for. Inexpensive PWM dimmers for LEDs are available nearly anywhere that the strips are. The one pictured above was about $7 on Amazon and features a "click" position for the full OFF state. I'm notoriously picky, even about the color temperature of a light, so I went straight to LedLightsWorld.com where I could order the exact specs I was looking for, straight from China! I ordered product #HK-F5050X30-X (12v Dimmable, 900lm/m) with the following options: 100cm, Nature White 4500k, IP65 waterproof surface injection (only waterproofing that still has adhesive backing), 12v, Black background. Note that it took a month in total for the production and international shipping before I had my hands on the product. Check the end of this article for a quicker and even cheaper alternative. I ordered a couple of the DC barrel-connector extension cords as well, since they plug-n-play with the dimmer switch. For the install, I first cut the end off one of those cords (leaving a few inches on the short end for later use). I soldered & used heatshrink to attach the long piece to the LED strip. The strip was stuck onto the glass right next to the bottom trim. I figured it might stick to glass better as sometimes new plastic "sweats" oily residue, even after a good rubbing alcohol scrub. After some searching, I finally found some tiny wire/cable clips on eBay in black with the good 3M adhesive back (the gray sticky with red peel-off). You can see how the wire is run up the glass in the photo above, and then into the wiper motor cover. I used 3M double-sided trim adhesive tape to stick the switch on the inside edge of the wiper motor cover. This way there was no cutting or drilling, and you can just reach up and rotate the switch easily with one or two fingers. I marked the location of the switch with a little sticker on the bottom of the cover. The other full extension cable I bought was run through the hard top the same way as the existing wires and washer fluid line. Then I spliced that remaining short end of cable to a long section of red & black 16AWG speaker wire to run over to the passenger side. I now have a barrel plug connection in the same place as the factory disconnects in case I ever do need to remove the hard top. The speaker wire I joined to the barrel plug end was wrapped in a TechFlex type tubing and run alongside the in-floor subwoofer to the factory 12v accessory outlet on the passenger side. Each of those side panels come off easily by removing the 2 floor d-ring torx bolts, one hidden 10mm nut behind the roll bar, and then just pulling (there are 2 "snaps" holding it to the wall in the end). I spliced into the wiring for that factory outlet and added a 2-pin disconnect. I think it's good practice to always use disconnects so you don't end up having to fish a bunch of wire back out to remove some body panel or accessory later. Regular insulated spade terminals work fine, but I've been using waterproof automotive connectors from Amazon which can be purchased with 1 to 8 pins (these or similar...). I don't think those really cheap ones are truly submersible, but they should be fine inside the rig. For exterior connections I like the real Weather-Pack connectors, they are just more expensive and slightly bulkier. One more electrical tip... Did you know the rear cargo outlet in a JK can be constantly powered or only on with the Jeep? Your choice! In the TIPM (fuse box), note that fuse M7 has 2 possible positions (there are 3 holes). Placing it towards the passenger side will make the rear cargo outlet constantly powered and moving it towards the driver side will make the outlet a switched accessory. Nicely done Jeep! Here's the final product at night on full brightness (with the camera's exposure set fairly close to what I was actually seeing). In the next photos, I cranked up the camera sensitivity so you could see the dimmest setting versus the brightest. The clouds are lit up from Phoenix's light pollution in these shots taken near the edge of town. I promised to discuss a cheaper (and faster-arriving) source for light... and that is the "daytime running LED" bars that are all over eBay and other sites for super cheap right now. A 2 pack of these 6-inch COB style lights is under 10 bucks and together probably just as bright as the strip I purchased. 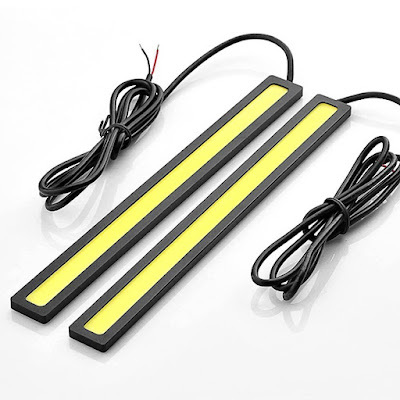 I have one of these bars as an under-hood light that you can compare to the strip light in the photo below. Whatever light source you choose, do get one - they are too simple and cheap not to. Now, let there be light! Thanks for posting. Very Cool! Great tip on the fuse placement to select the function of the rear 12v socket! You saved me from rewiring my neighbors JKU to achieve the constant hot function. Thanks! BTW, the rest of the article was great as well! I love this. Will have to do this to the rear glass on the camper shell for both my Chevy and GMC. Sure glad you finally got a JK Kris. You always come up with great ideas and I will be following closely. thanks everyone! sometimes the little mods are the best.